Capturing images of animals in their native habitat has given me my passion and vision for photography. I also derive immense satisfaction from my study of landscape photography. I want to give my audience an appreciation for all God’s bounty that surrounds us, nature’s animals, beautiful landscapes the world over, and the occasional man-made endeavor that warrants our attention. Studying the habits of animals has been key to shooting quality images. Some of my most exciting experiences occur when the unpredictable unfolds in my viewfinder. It is thrilling when I press the shutter release to obtain that truly remarkable image, such as American bison loping toward me with my only exit strategy: feet don’t fail me now! I draw from my dads saying, “When you’re green, you grow; and when you’re ripe, you rot.” His message to me was to continue seeking knowledge throughout my life. Learning how every change of light affects an image is challenging, and it is the essence and source of excellent photography. Advances in photography have been significant. Thus, new techniques and processes provide me with a platform for a lifetime of learning. With that, my “to shoot list” is long. Beautiful images abound: the Golden Gate Bridge partially enshrouded in fog; tulips in full bloom during an early spring visit to Monticello; or a lonely floral arrangement left at The Wall in Washington, DC, to convey remembrance of a loved one. 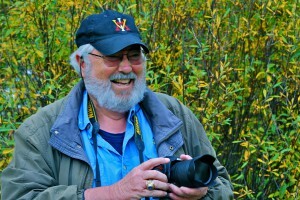 I have taken hundreds of thousands of images over more than four decades. However, I am discerning with those images selected for my limited edition prints and canvas giclées for my Collections. My wish is for these images to inspire and to touch your soul. I am optimistic that they will strike a chord, stirring your own efforts to better preserve our environment and respect wildlife, to seek beauty, and to honor our heroes – men and women who take risks in order that we may live to better enjoy another day. Note: My thanks to my family and to Noel Wayne Baker, Rustic 22, and his wife, Leslie, for their capable assistance in editing my Artist’s Statement.